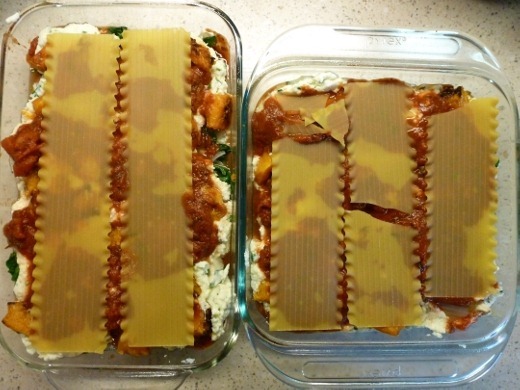 This past weekend I finally made one of the recipes I found in Cooking Light and have had bookmarked for months – Butternut Squash Lasagna! It also ended up being one of the more time-consuming recipes I’ve ever made. Luckily most of the steps were pretty fun. One of my favorite ways to spend a Sunday afternoon is cooking. My first step was to peel and chop a monster butternut squash. 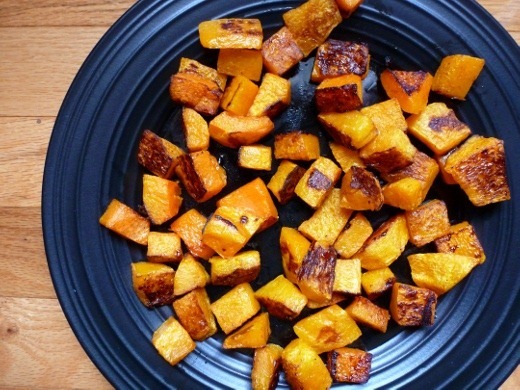 Rather than microwave the squash per the recipe instructions, I instead followed the suggestion made by several of the reviewers and roasted my butternut squash in the oven, after tossing in olive oil. 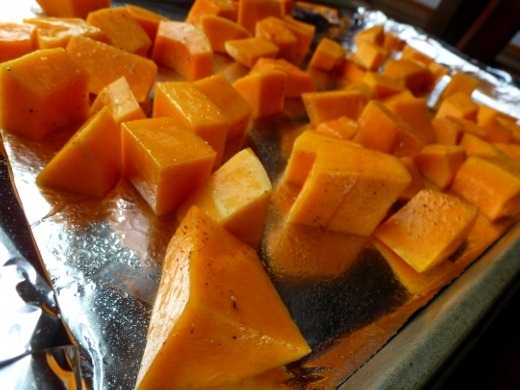 I thought this might sweeten up the squash a bit too, and remove some of the excess moisture. I wish I had used additional squash, because I forgot how much roasted veggies shrink. Thirty minutes later, nicely caramelized and soft butternut squash chunks. 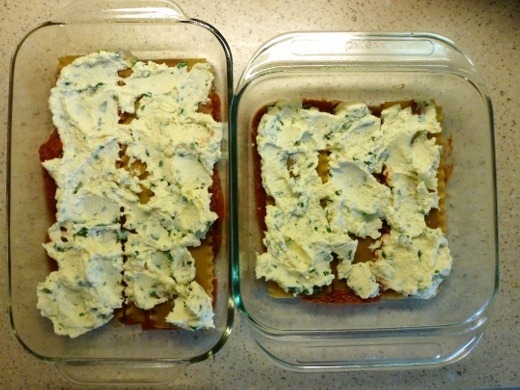 I did mash the pieces a bit before adding to the lasagna. 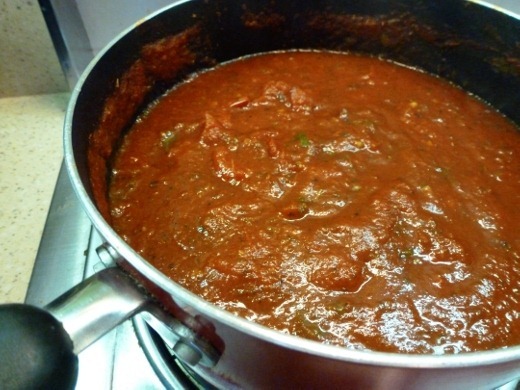 The next step was to make the homemade marinara sauce for the recipe – Smoky Marinara. 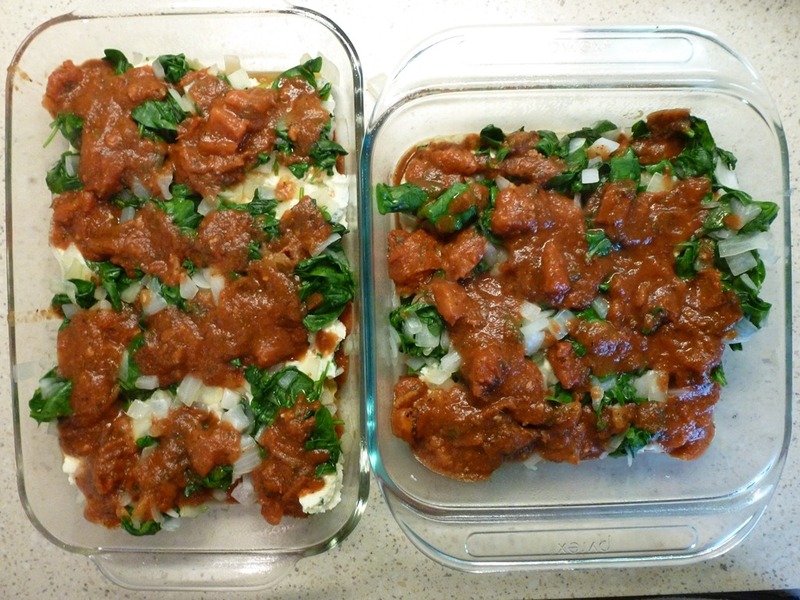 Throughout the dish, I seasoned all of the elements with an artisan smoked salt that I purchased in San Francisco, to try to carry the smoky element throughout the entire lasagna. 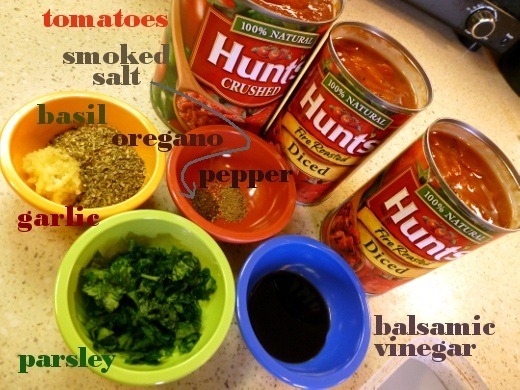 The homemade Smoky Marinara calls for one large 28 oz can of crushed fire roasted tomatoes and one large 28 oz can of regular crushed tomatoes. 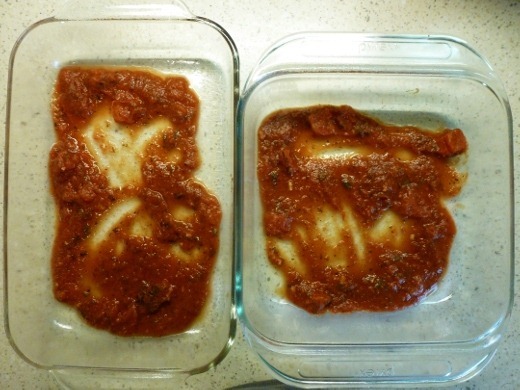 I couldn’t find the fire roasted crushed tomatoes, so I instead used two 14.5 oz cans of fire roasted diced tomatoes, which made my sauce a bit chunkier. I would recommend using all fire-roasted tomatoes if available, for a more intense smoky flavor. To the garlic, basil, oregano, parsley, pepper, and smoked salt, I added balsamic vinegar and all of the tomatoes, and then let the sauce simmer for 10 minutes. At that point the sauce was done, however, I had more prep work to do, so I popped a lid on the sauce, and continued to let it simmer on low for another 30 minutes, to deepen flavors. 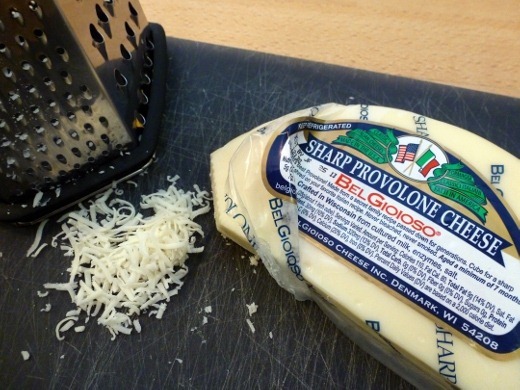 Thirdly, I prepared the cheesy element of the dish, which included trying a cheese that was new to me – sharp provolone! 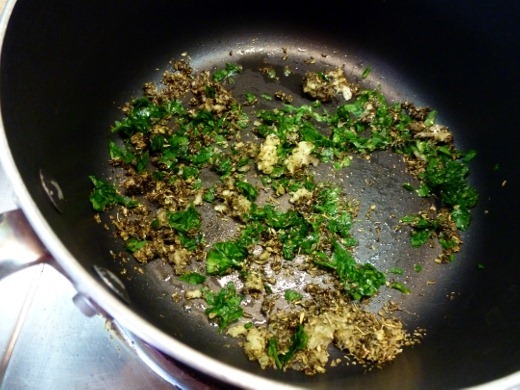 It was very yummy – nutty, and perhaps similar to parmesan, but not as hard. 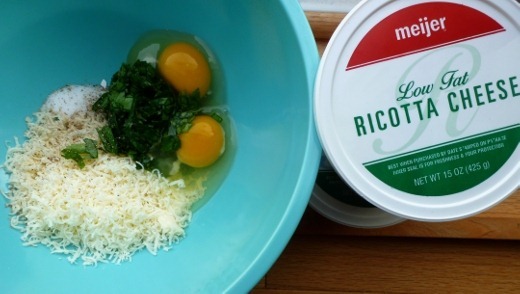 In addition to the sharp provolone, I added parsley, salt, eggs, and two cartons of ricotta. Now for the fun part – layering! Well, maybe. This took FAR longer than I ever expected! 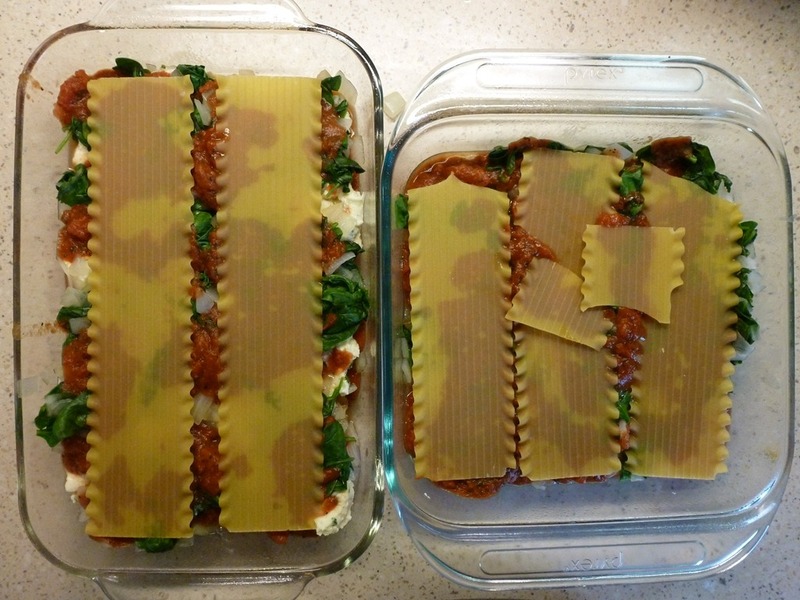 I must have spent a solid 45 minutes layering this lasagna. Admittedly, if I’d had a print-out of the recipe to refer to instead of running back and forth between the kitchen and my laptop this step would likely not have taken nearly so long. Also, obviously, I took the time to photograph each layer. I got a tad frustrated about halfway through because I realized I did the butternut squash and spinach layers out of order, but in the end it didn’t even matter! 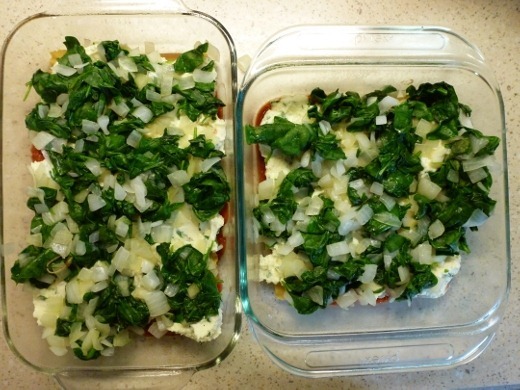 The dish also contains a layer of sautéed onions and spinach, not mentioned above. I would have liked more squash! I’d recommend using more than the recipe calls for, because, as you can see, my squash layer is quite sparse! 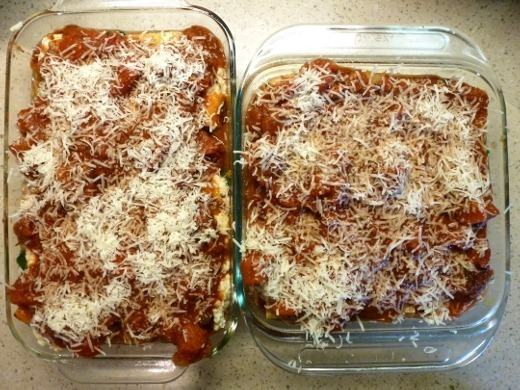 And, if you didn’t notice, one of the huge bonuses of this recipe is that it makes TWO casseroles! 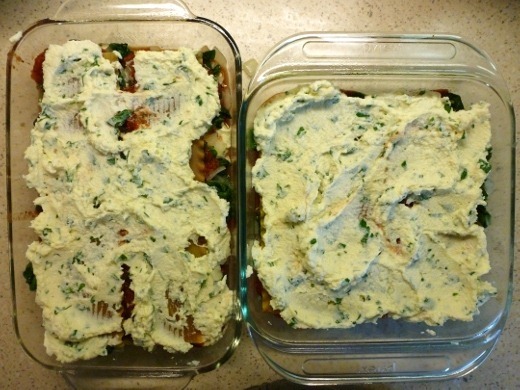 After assembling the two lasagnas, one went in the oven for an hour (covered for the first 30 minutes), and the other went into the freezer, after cooling for a bit. Can’t wait to pop that baby out for a super easy weeknight meal in the future. 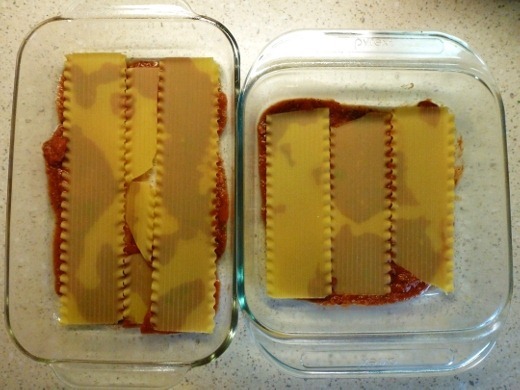 Here’s how my Sunday night lasagna appeared. I was drooling when I retrieved this guy from the oven. Mmm! Loved this lasagna and didn’t miss the meat at all! Though it was A LOT of work, it was fun to prepare, and made enough for extra lunches, plus a whole ‘nother casserole dish is waiting in the freezer! 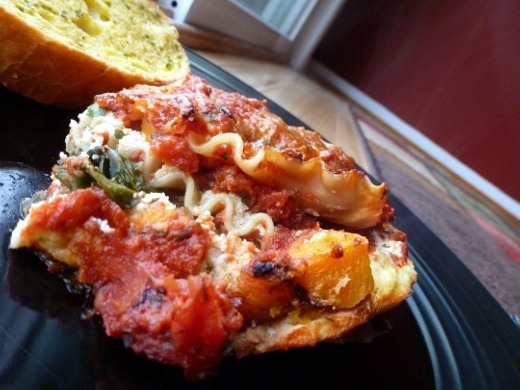 Incredibly delicious, flavorful, and comforting! 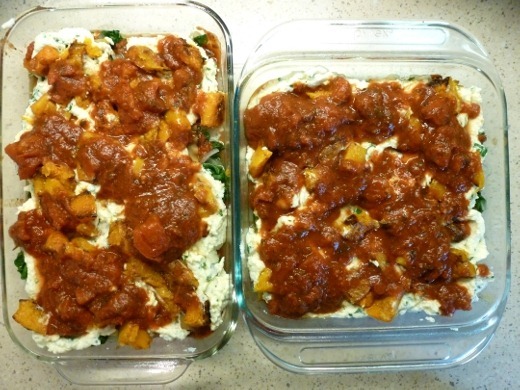 Plus it is packed with nutrition from all the healthy veggies – butternut squash, tomatoes, and spinach. 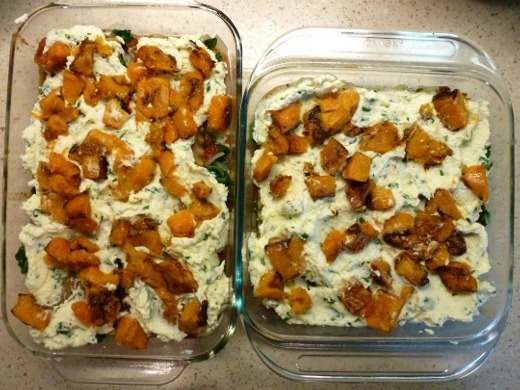 Butternut Squash Lasagna recipe from Cooking Light. 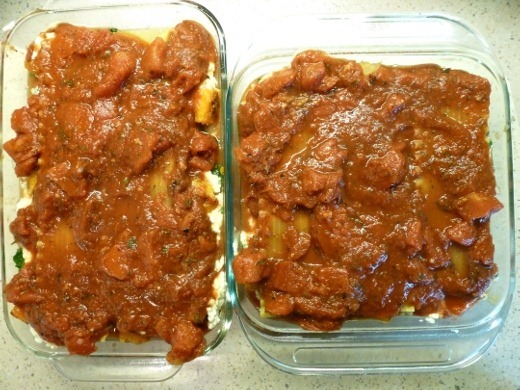 Calories: 254 per serving (six servings per 8×8 pan). Currently listening to: Amsterdam – Coldplay. I cannot believe I only just recently discovered this song – it is incredible. I’ve been belting out this song while listening to it on my iHome all weekend. Agreed! Can’t wait to bust out that second casserole from the freezer. Pingback: Philly Cheesesteak Sandwiches « Meg.Goes.Nom.Nom. Pingback: How It Panned Out « Meg.Goes.Nom.Nom. 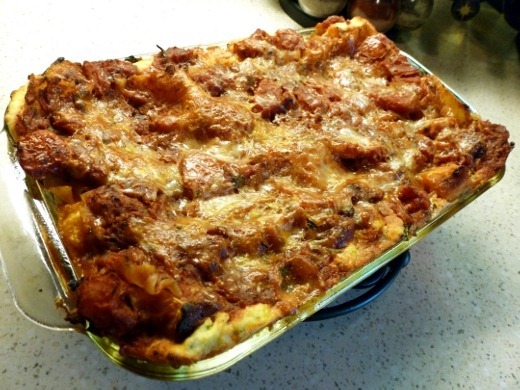 Pingback: Sausage Lasagna « Meg.Goes.Nom.Nom.